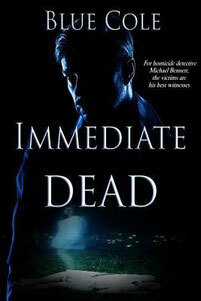 Immediate Dead by Blue Cole is a book unlike any other I have read. Michael Bennett's best friend was killed when they were teenagers. Instead of the normal situation where one would see a body laying on the ground, Michael saw his friend standing over his corpse, wondering what had happened. It was the beginning of a different life for Michael. At the time I met Michael, he was a detective with the Atlanta Police Department. He had gone through numerous partners but didn't really care because he preferred to work alone. His gift - or was it a curse - set him apart from his peers, yet his success rate at solving homicides quickly was unprecedented since the victims were the key witnesses. Enter Sandy Cooper, the newest partner to be assigned to Michael. She knew there was something different about him and was determined to find out what it was; it didn't take long. Sandy shook his world in a way he didn't expect, going the extra mile to help him (and his sister's family) in their greatest hour of need. Of course, all of these things happened in the midst of trying to find out who was murdering doctors who worked at the same hospital, and the common link between them. The story was wonderfully told, another book which caused me to lose a few hours of sleep. The characters were well defined with enough back story told at appropriate times and doses so I was able to identify with them. There was a lot of suspense (in certain scenes) which caused me to fear what would happen. Immediate Dead pulled me in and didn't let go. Even at the end, I was hoping for more and was glad to hear there would be other stories featuring these characters whom I'd grown to care about so quickly. If you would like to learn more about Immediate Dead by Blue Cole, please visit the book's page on Amazon.